The Mid-Atlantic Leader In Turf Field Removal And Recycling. Used turf has many uses, from landscape applications to dog parks and many more sports uses. With our Turfinator™, the field is first cut accordingly. The second step is removal of the infill, with our state of the art equipment. Removing the infill allows the customer to “reuse” the infill in the new field, if its condition is favorable. If the infill is not favorable for reuse in the new field, the material can be used in many other applications. 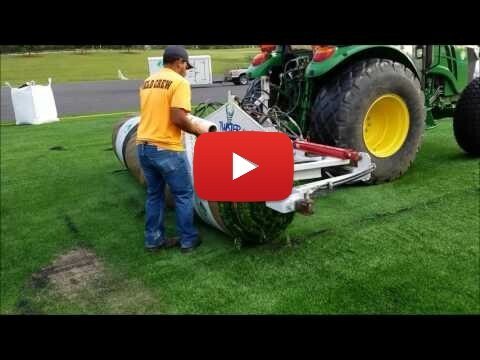 Old turf fields can now be turned into new turf infill and backing, as well as other products, such as crude oil, custom bi-products and artificial lumber, as such, helping the environment. The final step is to roll the turf in bundles to be loaded on flatbeds and sent to the end user. King Sports actively looks for individuals and companies interested in used turf and infill when we perform a removal project. We do not typically stock used materials, but if you have an interest in the used materials, please contact us through the contact page, and request to be put on our call list, so that we may notify you when we have a project in your area.